Fieldsports Channel’s Charlie Jacoby has been defending conservation hunting again. Channel Five’s Jeremy Vine show in the UK, hosted by Anne Diamond, lammed into trophy and big game hunters in April 2019. This follows a series of attacks on the sport, which remains the world’s biggest conservation provider. In March 2019, the usual celebrities – including Chris Packham and Joanna Lumley – lined up to attack trophy hunting over news of what British hunters brought home in 2017-2018. In a one-sided story condemning trophy hunting, it failed to point out the WWF-backed conservation benefits of trophy hunting. Instead, it called for a kneejerk ban. Big game hunting has been at the forefront of wildlife conservation. Here’s our story about one of the most iconic spoecies that hunters have brought back from the brink of extinction: the markhor goat. And here is Fieldsports Channel contributor Jens-Ulrik Hogh defending Markhor goat shooting on Danish TV. The modern problem for trophy hunting began with the Cecil The Lion story in 2015, when a US trophy hunter called Walter Palmer shot a lion in Zimbabwe that the animal rights lobby successfully presented as an animal called Cecil, claiming it was popular with tourists. Worldwide government actions following this incident led to some of the biggest and most tragic wildlife slaughters ever seen in Africa. As trophy bans fell into place, wildlife poaching boomed. By the beginning of 2018, a kneejerk US trophy import ban on Tanzanian elephant and lion trophies was beginning to have real – and potentially devastating – consequences, including the loss of decades of successful nature conservation. In March 2018, the following sad message came from Eric Pasanisi, one of the largest outfitters in Tanzania. Until now. “I confirm that I surrendered all my hunting blocks of all my companies today.My family has been the longest operating company in Tanzania – for more than 40 years. We have been the biggest operator in Tanzania and all of Africa. We have held the largest part of the Selous, with prime blocks, the same since 1978 which I finished surrendering all today. We have gone from 126 safaris per year to a handful because of the closure of US elephant and lion trophy imports. We cannot book enough 21 day safaris to make a profit or stay in business without lion and elephant imports into the US. Our losses are escalating so I have to stop. “When US elephant and lion hunting imports were threatened we stepped up our anti-poaching to US$2.4 million in three years. We by ourselves funded 100 Selous game scouts for many years. You saw our books and took copies of our ledger sheets for US authorities. You saw the newspaper clippings of the vehicles and plane our foundation delivered. You even attended the public ceremonies with the minister. Remember the work done! I know that Warden of the Selous wrote to the US how important our presence was to control poaching in the Selous. At the same time I have donated many full safaris to Shikar for auction to fund the US$500,000 for lion studies and aging, work that was ignored by USFWS, perhaps because of Craig Packer [US lion biologist and anti-hunting activist], I do not know! “The efforts of Tanzania, of my companies and foundation have been completely ignored by USFWS, so we have already been operating at a loss for too long it is time to stop and I cannot guarantee that the biodiversity of the hunting areas will not be lost now! “Our involvement in anti-poaching has become almost zero this year because our income losses. I think that the decisions by USFWS will eventually exterminate all Tanzania wildlife outside National Parks because of their determination to stop the importation of trophies into the US.Everything will end very quickly and wildlife will disappear in these areas that represent almost one-third of Tanzania territory. I have already returned 10 blocks the past years and with no hunters in the field it is going to be very difficult to save our last elephants. 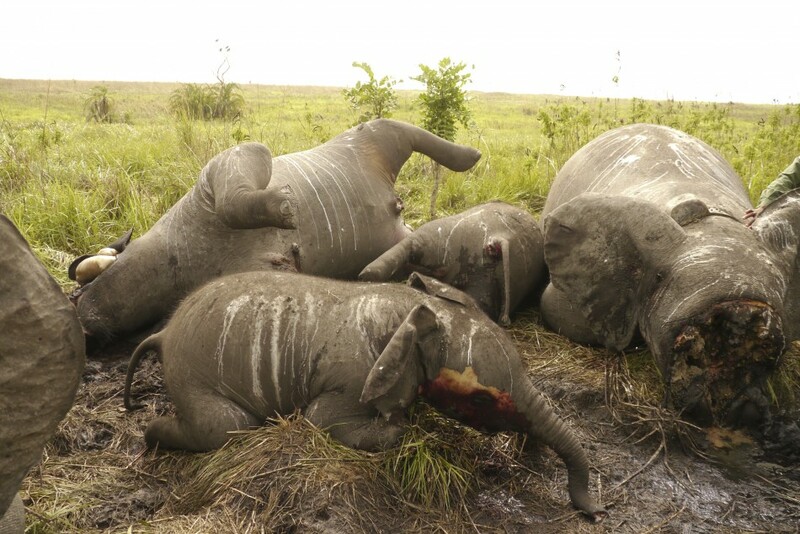 Our poor elephants, our poor animals, SHAME on….!!!! “The real truth is that everyone does not care and nobody can realize the irreversible damage caused by such decisions. It is certainly the END OF THE GAME if your governments do not realize and help Tanzania. Anyway, It is already too late for me, and soon it will be too late for other outfitters. By the end of 2018, the reality of the benefits of trophy hunting was beginning to hit home, even among the readers of the left-leaning Guardian newspaper. After the Guardian orchestrated a campaign against African big game hunting by antis including Labour leader Jeremy Corbyn and actress Joanna Lumley, it has climbed down in the face of angry letters from the staff of dozens of African conservation bodies. “It is heartening that so many people have strong feelings about conservation, as evidenced by the letter expressing a desire for a global ban on trophy hunting. However, this well-meaning call risks unintended negative consequences for both wildlife and for impoverished rural people. “For rhino, elephant, lion and all the species mentioned in the letter, the International Union for Conservation of Nature (IUCN) – the global authority on conservation – considers that trophy hunting is not a key threat to their survival. Indeed, well-managed trophy hunting has led to increases in populations of rhino, elephant, lion, markhor, argali, chamois and others. The main problems facing these species are habitat loss and fragmentation, conflict with local people, prey base depletion and illegal poaching. Namibia’s top ecologist also hit back against a letter in the Guardian newspaper against trophy hunting. Dr Chris Brown, chief executive of the Namibian Chamber of Environment, has written an article saying the current campaign against trophy hunting is a western urban cultural imposition on the rights of rural African communities. He asks whether the Guardian is displaying ‘arrogant cultural superiority or ignorance’. Brown goes on to ask: what is really behind the call for a ban on the import of wildlife trophies into the UK? The Namibian Chamber of Environment (NCE) is an umbrella membership body for environmental NGOs in Namibia. The NCE currently has a membership of 64 environmental NGOs – well over 90% of all ENGOs in the country. Dr Brown is not a hunter. He has been a vegetarian since the age of 11 because of welfare issues around domestic animals, a former director of the Namibia Nature Foundation (for 12 years) and the first Director of the Directorate of Environmental Affairs in the Namibian Ministry of Environment & Tourism. He has a PhD in conservation biology and interests in the tourism industry in Namibia. Since then, the Guardian has moderated its language on the issue. What it previously called ‘cruel, immoral, archaic and unjustifiable’, it now refers to as ‘the complex issue of big game trophy hunting’. Eamonn Holmes’ description of a hunt as ‘murder’ provoked a mass of death threats against hunters and shooters on social media. The ITV This Morning presenter made the comment while interviewing Fieldsports Channel’s Charlie Jacoby and a representative from the League Against Cruel Sports on the daytime show. Holmes, co-presenter Ruth Langsford and LACS policy director Chris Luffingham agreed on TV that ‘trophy hunting’ should be banned. Charlie Jacoby made the point that trophy hunting is no more than animal management with the extra benefit of providing money for the conservation of species and habitats. In the TV interview, Holmes led the attack on hunting, calling a video of an elephant shot in Namibia ‘murder’, while refusing to accept arguments that the death of the animal resulted in significant payments to locals via the community scheme NACSO. In 2019, Irish radio show hosts attacked a caller who revealed he enjoys hunting. The consumer watchdog show Liveline encouraged callers to complain about poor service. When a caller called ‘Frank’ said he had lost 100 bullets worth €700 on an Air France flight to Zimbabwe, instead of trying to help him out, the radio show hosts attacked him and demanded he defend trophy hunting. Frank gave a spirited defence of hunting, but the RTE One presenters were against him. Thanks to Finian Carton for sending in this story. Frightened civil servants and corporations have responded with initiatives such as this one from Namibia in July 2018. It considered banning trophy photos on social media. Wildlife populations in Namibia are booming thanks to hunting. However, the country is scared of the negatve publicity that trophy photos generate in the wider media. This letter is from the Namibia Environment and Tourism Department, and demands big game hunters do not post pictures of themselves with dead trophies on social media – because, it says, the ‘practice tarnishes the image of the industry’. Namibia has reportedly rescinded this order after discovering that it won’t work.